On the surface, Wikipedia entries seem neutral– and their largely anonymous contributors in effect write the dominant narratives, on subjects from Chelsea Manning to Tempelhof Airport. But in the name of crowdsourcing and “truth,” Wikipedia obfuscates context, authorship, and power– even as it marginalizes the views of women, LGBT, and communities of color. My project, Wikipedia Was Here, builds upon the site’s decentralized, networked landscape of knowledge production, to reveal: Whose truth? Who writes the public narrative? Wikipedia Was Here is a website that visually discloses the location of anonymous edits in real-time. The site geocodes the IP addresses of new Wikipedia edits, and shows corresponding visual imagery from Google Maps and Street View. At the same time, it also presents the name of the entry in question and the changes being made. The project also includes an archive, which viewers can search by Wikipedia entry or location– allowing us to critically examine edits that would typically go unnoticed, or easily normalized. When are anonymous editors leaking crucial facts? Drawing upon local knowledge? Reporting “facts” without evidence? 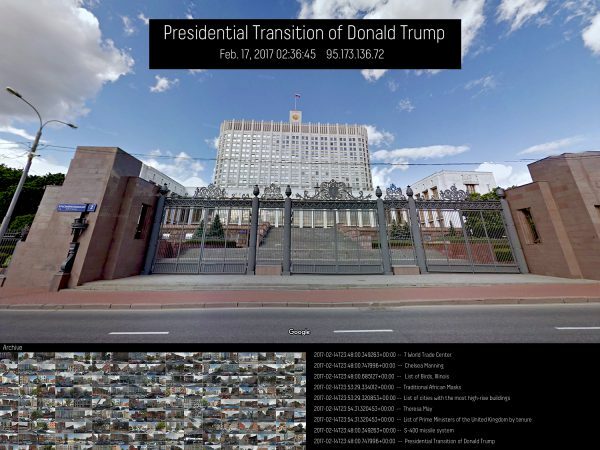 In a “post-truth” era, Wikipedia Was Here visualizes the cultural and infrastructural architectural contexts, and even hints of the political climates, in which entries are edited and rewritten. It aims to act as a countervailing force and make the production of popular knowledge—and its underlying power relations—more visible.